Teaching and learning from preschoolers. The air in the loft was steamy from the commingled respiration of the half dozen preschoolers massed together in the tight space. Emotions were balanced on a tipping point. Clearly, some serious rule breaking had taken place. Everyone was commanding someone else to “Stop!” As our children stood up for their rights, no one was entirely in the right and no one was entirely in the wrong. Preschool rules tend to be of the black and white variety: no hitting, no biting, no name calling. The “You Can’t Say You Can’t Play” statute, however, is a different animal. On the one hand, we don’t want to exclude others; on the other we need to honor our friends’ need to do their work without the disruption of outside elements. In this example the core conflict stemmed from a group of diligent play dough baking princesses who objected to an invasion of some sort of band of rescue heroes wearing masking tape over their mouths. If the princesses sat idly by their game would be wrecked by all those extra bodies. Defending the world they had built together meant excluding someone. In a court of law the defense attorney would argue self-defense, while the prosecutor would counter with the rights of individuals to use public property. In other words, “You Can’t Say You Can’t Play” is a gateway law into the adult world of legislative ambiguity. At heart, most three- and four-year-olds are fundamentalists. They are still feeling out the shape of their world and just as we adults have learned to start puzzles by locating the sharp corner pieces, they first understand social relations in their extreme forms. In inattentive moments we’ve all tried to correct our children when they express their fundamentalism in stereotypes such as “Boys can’t dance ballet,” or “Girls can’t be firefighters.” We point out exceptions to the rules only to have our rationalizations rejected or ignored. Like it or not, our words simply do not reflect the reality of our children’s experiences. Even if we think they’re wrong, even if we know that they will one day have to revise their thinking, and even as we work to bring that about, we ought also to be proud that they trust their own instincts and experience over our second-hand wisdom. “You Can’t Say You Can’t Play” is a place where the hard line between black and white is pierced. It’s messy as it always is when fundamentalism meets the pea soup of social reality. Even such obvious real world laws like those against murder are miasmatic swirls of gray. What about the death penalty? What about abortion? What about war? What about self-defense? Even as adults we tend to stake out fundamentalist views on our rules, but most of us know that reality must be shaped from compromise. When conflict erupts in class, our first responsibility as adults is to insure safety. Handling physical aggression is our highest priority. We use our superior strength to grab swinging arms and restrain kicking feet. We clutch out of control bodies against our own if we must. We do it from love, even if it looks like a little like violence. That accomplished, both sides need to be given the opportunity to state their case. Everyone should be given a chance to talk – even bystanders. We can’t make the others listen, but we can compel the primary disputants to stay within earshot. It’s important that we give everyone the opportunity to hear the other side of the story. I like to try to paraphrase each side’s perspective, both to let the child know she’s been heard, but also to give the other party a clear, simple picture of the other perspective. If someone is still too emotional to speak, I’ll try to at least point out the feelings (e.g., sadness, anger, frustration, fear) that the altercation has caused. Understanding the other side’s point of view is the starting point for any successful compromise. In an ideal scenario, the adult sums up the conflict succinctly, then offers a statement along the lines of “I wonder what we should do about this problem,” or “We need to find a solution.” Often it’s the bystanders – those not so deeply invested, nor so befuddled by strong emotion – who make the first suggestions. I try to encourage children to speak directly to each other rather than through me. Our instincts as adults is to “know” what’s right and to try to steer the conversation toward a certain solution (e.g., sharing, taking turns), but I’ve found it can be profitable to resist this urge. I’ve seen children fighting over a stuffed animal decide that all 6 of them will carry it around together. They then spent five happy minutes wandering around the classroom each gripping an appendage, until it was finally dropped to the floor as the group moved on to other more pressing matters. A conflict over a small pennant was solved when one boy – a bystander – got the others to agree to hand over the flag each time he said, randomly, “Ding!” It was a game that lasted a half hour and grew to include several other children. Naturally, the children will more often than not need your adult wisdom to help them arrive at a “solution”, but I like to at least give them the chance to come up with their own compromise. One of the rescue heroes looked at me with an expression that plead for escape. I moved aside and the boys tumbled down from the loft. By the time their feet had reached the floor, the princesses had returned to their baking. Compromise is tough and sometimes it’s too much work. That’s why we also learn to pick our battles. What's So Bad About Ronald McDonald? Strangers are targeting your child. Not with weapons, thank god, but with media messages designed to make them beg, whine, and cry until you finally break down and buy yet another piece of crap. Excuse my French, but that's the technical word for most of the toys, electronics, candy, and "food" they sell to children. In college I was part of a student team working on a media buying plan for McDonald's. Our research turned up the fact that in households with children between 2 and 8, it's predominately the children who make the decision about what restaurant their families frequent. At the time Ronald McDonald was a more recognizable personage for this age group than Santa Claus. We could never determine whether advertising was the cause or effect of this phenomenon, but I just can't imagine that 2-8 year-olds had a lot to say in restaurant decisions during previous generations. Twenty-five years later the ability of marketers to get at your children has only increased. And just as we move heaven and earth to protect our children from those who would target them in other ways, it behooves us to take measures to protect our children from these marksmen as well. It's not just television advertising -- but it's mostly television advertising -- that we're talking about here. We're all aware of the staggering statistics about how much TV American children watch. I feel confident that most of us adhere (more or less) to the one hour per day model, but even so, if you permit commercial television you chid is being bombarded by dozens of commercial massages a day, hundreds a week, tens of thousands a year. (Don't be deluded into thinking that PBS is safe: its programming is rife with subtle commercial come-ons and merchandising tie-ins.) And these aren't just index cards posted on a community bulletin board. These are pitches employing the most powerfully persuasive techniques known to man and they are targeted directly at your child. Of course, your child has no money of his own; she can't take herself to the store or restaurant. No, these marketing geniuses realize that they must rely on our little ones to in turn "persuade" their parents. Children are no less marketing geniuses, tending to eschew high tech methods, however, in favor of the old school techniques of persistent pleading, sulking, and tantrums. Even if we parents manage to resist their rhetorical efforts, it generally winds up with children feeling denied, and parents feeling -- at least a little -- like mean-spirited ogres. Avoiding TV altogether is, of course, the best solution, but abstinence is not realistic for most of us. Many pediatricians recommend no television for children under 2-years-old, then no more than 2 hours a day thereafter. I've only personally known one child who was successfully kept from television during her preschool years, but as a kindergartner she proudly told me that she can watch TV now. People are weak. Most of us cannot be lifelong TV virgins. This is why we need commercial prophylactics. I warn you that the following guidelines (which I've gathered from a number sources, including parents in our preschool) are far from 100% effective, but they can at least help in your efforts to protect you child from advertising executives and their designs on the peace of your family. A responsible adult should control the TV as they would any narcotic. Even as your child grows older and can operate the TV himself, he should be expected to ask permission before watching. As I see it, it's a fundamental responsibility of American parents to closely monitor what and how much their child watches. Develop a TV viewing "plan" that can function something like the rules we use in our preschool. If you make the plan clear to your child, it's not you, the parent, limiting your child's viewing, but rather it's the plan. Some families like to predetermine viewing schedules at the beginning of each week; others take it day-by-day. In our family we began rationing TV by giving our daughter Josephine 4 poker chips every day, each worth 15 minutes of viewing time. We eventually dropped the poker chips after a time, but the concept lived on, with her having innovated the idea of saving her "chips" for a couple of days in order to "buy" a longer movie later in the week. It turned out to be a valuable lesson in delayed gratification. Whatever you do, the key is to stick to the plan. The moment your child knows the plan isn't written in stone is the moment she will conceive of the idea to plead for exceptions. Watch TV with your child as much as possible. Not only do most children enjoy the companionship, but it puts you in the room with those who will target your child. And as powerful as they are, you are more powerful. I know that you have phone calls to make and floors to mop, but there are many chores (folding laundry, ironing, filing, personal grooming, and even exercise) that can happen while you watch. Not only will you be role modeling active behavior, but you will be there to talk during the show. That's right, there is no better counter-balance to the narcotic haze of passive viewing than talking. As your child questions about what he is watching. Offer your opinions about what is going on. Create the sense that TV is a family activity. My memories of watching TV as a young child always include my mother, father, and brother together in our small den chatting about The Brady Bunch (I was Greg and my younger brother was Bobby) and The Partridge Family. I'll never forget Dads' response to my comment that Danny Partridge was funny: "It's just the way his pants fit." I still use the line while I've forgotten everything Danny ever said. On Sunday we would eat popcorn and apples for dinner while watching The Wonderful World of Disney. I have no memories of the actual programming, but very clear ones of the family tradition. TV is not the same as going to a movie or the theater -- silence is not golden. And forget the misguided notion that watching TV is restful. Reading is restful. Naps are restful. Watching TV alone is narcotizing. At an early age, Josephine became a master at deconstructing the automobile and beer commercials that target me during sports broadcasts. By the time she was 5 she'd learned to guffaw at the notion that pretty girls will like a man for drinking a certain beer. She recognized when cars were shown performing impossible feats of speed or agility. She when the commercial was targeted at her. It was a gratifying day, however, when she said, "That won't really make me popular." If your child is aware of any brand at all (Disney princesses, McDonald's, Star Wars), she's ready for your own home school media curriculum. Children need to understand that advertisements are created by people who are trying to get us to either buy something or do something. it's a fun game to dissect a commercial message: Who is trying to persuade us? Why? What do they want us to do? How are they trying to get us to do it? What do they take us for -- fools? For very young children, the game might just be to play "spot the commercial". It can be difficult for a 3-year-old to distinguish between the sales pitch and the "entertainment", but it's an important media skill to learn. Try covering your ears and talk about how the commercial makes you feel with and without sound. This can be a great example of how advertisers try to manipulate our emotions. How do certain commercials make us feel and why do they want us to feel that way? Commercials often boast about taste tests and other comparison surveys that prove their products are the best. Why take their word for it? Do your own taste tests. Mike if even more fun by involving friends. Does the heavily advertised brand really taste better than the store brand? It's not something most of us can afford on a regular basis, but I would occasionally purchase an advertised product that Josephine wanted simply for the purpose of demonstrating that it's a piece of crap. A less expensive method is to point out advertised products while shopping. How does the actual product compare to the advertisement? Examine the label (especially if it's food) and the packaging. What did the commercial leave out? Where did the commercial exaggerate? Do you feel the same way about the product in your hand as you did about the one on TV? Why? Young children can often become confused about what is real and what is make-believe on TV. Talk about whether or not what is happening on the screen could happen in the real world. Lest you've missed it, my personal belief is that targeting children with advertising messages is unethical. I've been known to write to companies that I find the most offensive. There are some who would have it be illegal altogether. I won't go that far, but that doesn't mean we can't use our consumer power to pressure companies. The real battleground, however, is in your living room. This is where these strangers find our children with their slick, deceptive messages, stoking the flames of unattainable desires in their little souls. Most of us have lived our entire lives as targets. We don't know life any other way. Some of us have made our peace with it, while others are still trying to figure out what it all means. Whatever the case, it's certain that advertisers will continue to step up efforts to target your child with junky toys and junky food. And we, seasoned veterans that we are, like it or not, have the job of teaching them how to sort through the crap. This is my personal blog and is not a publication of the Woodland Park Cooperative Preschools. I put a lot of time and effort into it. If you'd like to support me please consider a small contribution to the cause. Thank you! 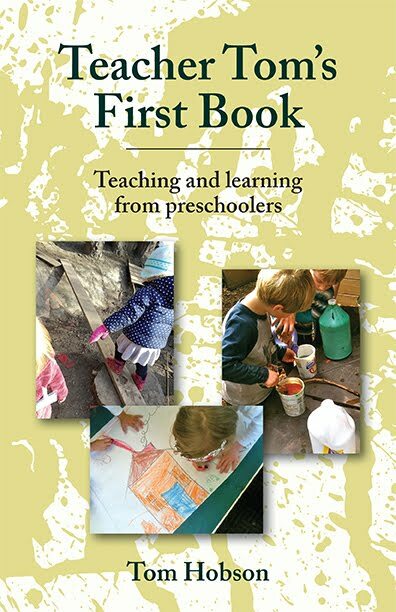 I am a preschool teacher, blogger, speaker, artist and the author of Teacher Tom's First Book (teachertomsfirstbook.com) For the past 18 years, I've taught preschool at the Woodland Park Cooperative School. The children come to us as 2-year-olds in diapers and leave as "sophisticated" 5-year-olds ready for kindergarten. The cooperative school model allows me to work very closely with families in a true community setting. I intend to teach at Woodland Park for the rest of my life. I love the kids and I love the families. It's an incredibly rewarding job.